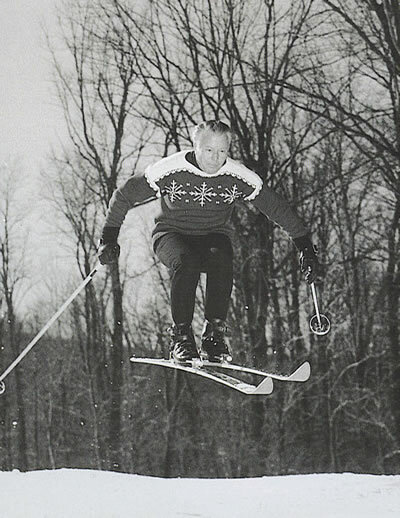 On the Contribution of Austrians to Skiing in the U.S.
During the late 1950s, when Sepp Kober came to the United States, skiing was not well established in the United States. At that time there were no ski resorts in West Virginia or North Carolina. This former Austrian national team skier introduced skiing in the Southeast by founding the first ski resort and ski school at The Homestead, in Hot Springs, Virginia. Recently he was presented with Tyrol’s Adler Award in Silver by Austria’s Ambassador to the U.S. Eva Nowotny. At a reception in Hot Springs he was honored for his pioneer work in particular for having brought many Austrian ski instructors to this country. Originally from Igls, Austria, Kober, now in his 80s, can look back on a lifetime of designing and developing 17 ski areas in Tennessee, North Carolina, Virginia and West Virginia. He was also a founding member of the U.S. National Ski Areas Association, President of the Southeastern Ski Areas Association and an honorary member of the U.S. Professional Ski Instructors of America. Referred to in several publications as the ‘Father of Southern Skiing’, can you tell us how you acquired this title - starting with the circumstances surrounding your coming to the U.S. and the various stages of your career. After the winter season I used to work in the summer in the reception desk of two of Innsbruck’s top hotels, Hotel Europa and Hotel Tyrol. While there I met a gentleman who came every year to bring instructors to the U.S. to work for a ski school and he asked me whether I would like to come. This is how I eventually came to the United States, along with Othmar Schneider, Hans Senger and others. We stayed after the season and tried to find a job on our own. Othmar Schneider went to Boyne Mountain, and I went to West Virginia. As a matter of fact, it was there that they needed someone and so they got in touch with the Austrian Tourism Department and the Tyrolean Tourism Office, which gave them my name. In 1959, at The Homstead, one of the nine top resorts in the U.S., they had to decide what to do in winter. The hotel had 600 beds with only 50 people staying there during winter. At that time snowmaking started to become very popular. They found out that most nights it was below freezing, which you need for snowmaking, so they decided to become a four season resort. They got in touch with me and asked me if I would like to come for an interview. When I arrived I said, “My goodness, this looks like a European ski resort!” They offered me a five year contract. My job was to finish the construction, purchase the rental equipment and open a ski shop. That was in May 1959. I started the ski school with the few instructors I could find, but it was very difficult because there were no qualified instructors around. I knew two people - one from Innsbruck; the other one had taken the job I had in West Virginia. I brought them both to the U.S., and we started off with two instructors. Eventually I got some part-time instructors. In the winter of 1959/1960 the hotel was filled during Christmas and New Year. That changed the whole picture. When I started the sport of skiing at The Homstead, I had to purchase the equipment. At that same time, companies came to me and asked me whether I would like to represent them. So I took the job and represented ski companies and a lift company. That was a good job because during the summer I was free. By the end of the 60s and 70s, I had six states where I had opened up ski shops and ski areas, trained personnel, and placed instructors in my schools who I had brought from Austria to get started in their own business. Some of the ski schools I franchised (“Kober Ski School”). That’s the way it really started. Of course the real estate companies were soon there, selling lots and building chalets. Especially down in North Carolina it really boomed; and it was the same in Virginia. When skiing in the Southeast began, it was a really good business for them. Having managed many ski resorts, what are the main differences between the U.S. and Austria in the general attitude towards skiing? Has it become a tradition in certain areas, such as in Austria, or is it more of a fashion? It is basically like Europe. When snow falls, people come. Now we have grooming equipment, and people are already used to it. What has changed is that snowboarding is now very popular and has begun to overtake skiing among the young generation. In certain areas they do not allow snowboarding because of the dangers, while other areas have snowboarding slopes. A few years ago the ski industry was at a real low. As snowboarding increased in popularity it really saved the ski industry. The technique is also very much the same. Having Austrian ski instructors here was a drawing card for the ski school because of the history of modern skiing having begun in Austria. When Hannes Schneider moved to North Conway in the 30s, he taught the Arlberg Technik. When Sun Valley started, they right away had an Austrian Ski School with Hans Hauser, who is from Salzburg. Having Austrian instructors was also a drawing card for people to come. It is pretty popular if you have an Austrian ski school. Today the entire world is concerned about the dire results of global warming. Lack of snow in many ski areas throughout Austria is attributed to the general change in climate. To what extent does this global climate problem worry you? It depends how this will continue, but it definitely will affect snowmaking. When I came here in 1959, we had so much snow that we basically did not need snowmaking. Today there is hardly any country that doesn’t have snowmaking. The same is true in Austria. Of course some places have problems with the water. You need so much water for snowmaking. Furthermore, low humidity is important for snowmaking. Shortly before writing this article, another significant Austrian ski figure, Walter Foeger, who helped develop the Jay Peak Ski Resort, passed away in Austria on February 10, 2007. Born in Innsbruck in 1917, he arrived in 1956 carrying little more than his Kneissl skis and a dictionary. Intrigued by the barren and unknown area located just south of the Canadian border in an obscure corner of Vermont, Foeger saw its possibilities as few others did. Within a span of twelve years, he had created Jay Peak on some 385 acres, carving trails into the mountain by working with its natural contours. Today Jay Peak is a prominent ski center with over forty trails, seven ski lifts, an aerial tramway and a year-round sports complex thanks to Foeger’s realization of a long-term vision. He established an alternative and successful ski teaching system and contributed his expertise to the development of the ski economy in northern Vermont and elsewhere. Natur Teknik, Foeger’s innovative and direct-to-parallel ski instructional method, was introduced at Jay Peak in early 1957 and was still being taught as late as 1991. Foeger developed his unorthodox teaching method to help beginning and intermediate skiers achieve parallel skiing without using the snowplow and stem-christie turns employed by most other systems. Instead, Natur Teknik used “up-unweighting” of the ski tails, heel-thrust, and the “natural” counter-rotation of the upper and lower body to effect turns. He first published his ideas in the book, Learn to Ski in a Week (O’Shea Publ., Vt., 1958), followed by Skiing for Beginners (Ronald Press, NY, 1962). By the spring of 1965, he had certified many ski instructors to teach this approach and soon had created a network of ski schools throughout the Northeast teaching the Natur Teknik. 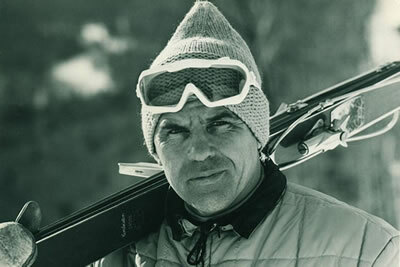 Walter Foeger made a major contribution toward advancing the sport of skiing in North America before returning to Austria in the 1970s. On April 28, 2006, he was inducted into the U.S. National Ski Hall of Fame shortly before his death one year later at the age of 90 in Nickelsdorf, Austria.